The children are learning how to properly set a table. 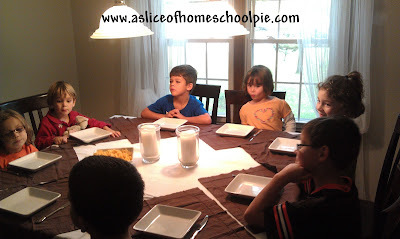 My friend Kathryn invited us and another family over to teach our children a lesson on Table Etiquette. The children ranged in ages from 5 to 10-years-old and participated with enthusiasm. She asked the children what should be the first thing they do before sitting at the table to eat. I loved the first response some of the children gave, "Pray." Kathryn explained that the first thing they should do is wash their hands. She then had them provide reasons why this was of importance. 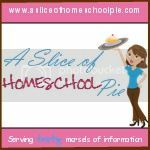 She showed the children a printout of a table setting and explained where each piece of silverware, glass, and napkin should be placed upon a table. After the children washed their hands, they each sat at the table and practiced setting it as they were each handed a piece of item. The children really enjoyed themselves and it was a pleasure to see them do so well with all of the instructions given. The moms had a fun time too.